The Hayward Fault is restless. On Monday evening (May 14), there was a 3.5 magnitude earthquake along the fault centered just east of Oakland. It comes just over four months after a 4.4 magnitude quake along the fault near Berkeley. The Hayward Fault runs through the East Bay from San Pablo Bay in the north to Fremont in the south, a more than 70 mile stretch that passes through Berkeley, Oakland and Hayward. There hasn't been a major quake on this fault since a 6.8 magnitude earthquake struck in Oct. 1868, causing massive destruction. U.S. Geological Survey scientists say the fault is "a tectonic time bomb," due anytime for another big one. For those of you who (like me) slept through most of geology class, a fault is a fracture in the Earth’s crust (its outermost rocky layer), the line where blocks of crust on either side have shifted past each other. As USGS explains more precisely than I can: "Not every crack in the ground is a fault. What defines a fault is the movement of the rock on either side. When that movement is sudden, the released energy causes an earthquake. Some faults are tiny, but others are part of great fault systems along which rocks have slid past each other for hundreds of miles. These fault systems are the boundaries of the huge plates that make up the Earth's crust. In the San Francisco Bay region, the Quaternary-active faults are part of the boundary between the Pacific and North American plates." The Bay Area is a confluence of faults. Mouseover this map to see the names of the faults (in red) nearest you. Click on the fault line for a description. 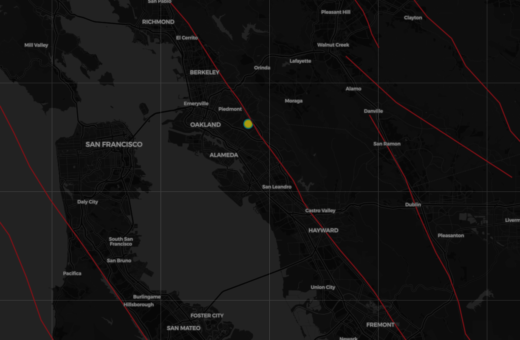 Zoom in and click on any recent quake for more specific location data. Blue circles represent earthquakes of 2.5 magnitude and greater that have occurred within the last seven days (updated every hour), using USGS data. Zoom out to see the locations and sizes of other recent earthquakes around the world. View a full-screen version of the official USGS map here. For more on the science of earthquakes, check out KQED's free e-book.